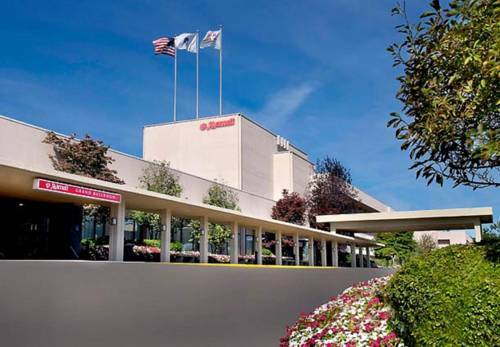 Spend a refreshing night in our contemporary rooms and suites at Boston Marriott Newton. Our hotel is located on Charles River close to popular attractions including Boston College and Brandeis University. Before exploring everything the Boston area has to offer, spend a night unwinding by watching premium cable and movie channels while you recline on our luxury bedding. In the morning, use room service to have breakfast in bed, or go by our Starbucks Coffee Kiosk to get a caffeine-induced jump start on your day. Need to stay productive? Use your room's ergonomic workstation or take a quick trip to our business center. In your downtime, work on your exercise goals at our sophisticated fitness center, or take a dip in our heated, indoor pool. After an eventful day, catch up with a friend over a variety of wine and cocktail options at Riverbend Lounge. Whether you're a business traveler or exploring the historical cities of Lexington and Concord, stay energized when you visit Boston Marriott Newton. Open for breakfast, lunch and dinner, our sophisticated bar and restaurant is located on the Charles River and serves an array of delectable dishes inspired by the local West Newton area. We offer a wide variety of coffee, teas, breakfast breads and fresh fruit to go. Start your morning off the right way by visiting our Starbucks Coffee Kiosk. Meet with family, friends or colleagues in our casual lounge-style atmosphere that serves local New England fare and an extensive wine and cocktail list. Forty feet tall, with a concession stand built inside. Retro-renovated in 2011, this was the first Dunkin Donuts shop, opened in 1950, when coffee cost ten cents. A plaque notes the location's importance in doughnut history. There is no drive thru.